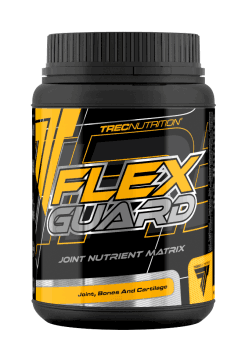 Trec Flex Guard is a multi-ingredient dietary supplement, which effectively supports the health of joints and connective tissue. The substances in the composition of the preparation facilitate natural collagen synthesis in the organism and inhibit inflammatory processes. Thanks to this, the supplement slows down the first signs of aging of the organism and facilitates regeneration after injuries. Collagen hydrolysate type I - is a protein component, which provides the organism with an easily available form of ingredients taking part in the synthesis of connective tissue. This type of collagen is the most well-known form of this protein in the organism, where it constitutes the main building block for skin. Collagen hydrolysate supports maintaining proper condition of skin, bones and joints, despite passing time. It results from the fact, that with age the effectiveness of collagen biosynthesis drops, which is responsible for the appearance of the first signs of aging. Hydrolyzed form of collagen type I ensures a valuable source of amino acids in the form of: glycine, proline and hydroxyproline. They ensure proper structure and stabilization of this protein, which ensures a good state of skin tissue and cartilage matrix. MSM - a compound, which is also called organic sulfur. It ensures a good source of this element. It is responsible for maintaining proper structure of cartilage matrix, as it ensures its proper hydration reaction. Thanks to this, joints are characterized by proper mobility and lubricating their surfaces protects from abrasion of cartilage surface. Organic sulfur is characterized by a strong anti-inflammatory and antioxidant potential. Such an effect is conditioned by the fact, that the active substance inhibits the secretion of pro-inflammatory substances (IL-2). Moreover, the activity of COX-2 enzyme is reduced, which takes part in the synthesis of prostanoids, which stimulate the course of inflammation. Thanks to this, MSM demonstrates analgesic effect and protects from the occurrence of degradation. Glucosamine sulfate - is a natural amino saccharide, which takes part in creating cartilaginous tissue in the organism. The presence of the sulfate group ensures efficient absorption of the active substance in the intestines. Proper supply of collagen slows down collagen breakdown progressing with age and mitigates the symptoms of inflammation. It is conditioned, as glucosamine molecule constitutes one of the substrates necessary for the production of this protein, thanks to which it ensures proper structure and function of the connective tissue. Similarly to MSM, it inhibits the activity of COX-2, thanks to which it effectively supports the organism in reducing chronic inflammations and slows down the development of degradations. Thanks to such an effect, glucosamine sulfate demonstrates analgesic effect, reduces skin redness and swelling. Glucosamine sulfate is hydrolyzed in the organism to glucosamine and sulfur compounds. The latter ensure proper flexibility and hydration of cartilages, which protects them from wearing out. Collagen hydrolysate type II - a peptide, which constitutes a basic building block of cartilaginous tissue in the organism. The hydrolyzed form of this protein ensures easily available source of ingredients, which ensure efficient absorption of collagen type II. It protects the structures built of this compounds (cartilages, ligaments and tendons) from weakening. The active substance demonstrates immunosuppressive effect, conditioned by increasing the organism’s tolerance to this antigen, i.e. protein. Collage hydrolysate type II induces the appearance of lesions in dendritic cells, which are responsible for the presentation of antigen for lymphocytes T. It results in their differentiation to anti-inflammatory populations of regulatory lymphocytes T, which secrete cytokine IL-10. It inhibits pro-inflammatory influence of interleukin 17, which effectively reduces inflammation in joints. Apart from the direct influence on the synthesis of collage type II in the organism, hydrolysate stimulates the production of collagen type I and hyaluronic acid. It ensures good state of skin tissue and delays the occurrence of the first signs of aging. L-proline - is an amino acid, which is essential in the process of protein synthesis. Among the compounds in this group, it is distinguished by the secondary structure, which considerably differentiates it from other amines. Proline is an important ingredient, which ensures efficient production of collagen (the main ingredients of skin, cartilages and bones). This compound ensures proper structure of joint surfaces, thanks to which they have proper amortization and hydration. It results from the fact, that proline is a precursor of hydroxyproline, which provides cartilage with such properties. People who practice professional sports have a very low level of this compound in the organism, thanks to which they are more prone to injuries. Chondroitin sulfate - a natural compound taking part in the synthesis of connective tissue in the organism. The combination of chondroitin and mineral salt ensures its higher level of absorption, thanks to which it achieves effective concentration in the organism in a shorter period of time. This compound is one of the main components of extracellular matrix, which ensures integrity and proper consistency of connective tissue. Thanks to this, the joint has proper mobility and protects from the occurrence of excessive immune response. A sulfur atom contained in the preparation ensures proper hydration in the cartilage, thanks to which the joint has proper lubrication and elasticity. Moreover, this element forms a barrier on the surface of joints, which absorbs shocks, protects from compression and damages. Omega-3 fatty acids - are unsaturated fatty acids, which in this complex are divided into: eicosapentaenoic acid (EPA) and docosahexaenoic acid (DHA). Their properly high intake ensures many health benefits. They are mainly related to their anti-inflammatory activity. Fatty acids omega-3 inhibit the occurrence of inflammation at the level of transcription. It is conditioned by inhibiting the secretion of pro-inflammatory IL-10 and TGF-β and decreasing the activity of COX-2. This compound takes part in the synthesis of prostaglandins, which stimulate the occurrence of inflammations. The supplement constitutes an important component of cell membrane of chondrocytes. After building in, they decrease the synthesis and secretion of enzymes, which have degenerating influence on joint cartilage. It protects from the development of osteoarthritis. Polyunsaturated fatty acids also facilitate the provision of calcium to bones, which reduces the risk of osteoporosis. Calcium - is an incredibly important mineral, which is a vital building block of bones and teeth. Maintaining a proper level of this element ensures proper bone mineralization, which is reflected in their structure and endurance. With age, the absorption of calcium to bones decreases, which is a factor that leads to the development of osteoporosis. Magnesium - an essential microelement, which plays many positive functions in the organism. The main reservoir of this element is bone tissue, in which it is an important building element. Deficiency of magnesium is related to bone demineralization, which considerably weakens their endurance. This element also has normalizing influence on the level of active vitamin D in the organism. It takes part in calcium metabolism, thanks to which it protects from bone mass decline. Vitamin C is one of the best-known pro-health substances. Its proper supply in a diet or supplementation is essential, as the human organism does not have an enzyme, which is responsible for its synthesis. This vitamin is an important cofactor, essential for the proper synthesis of collagen. Providing a proper amount of this compound slows down the drop of effectiveness of this process, which takes place with age. It was noticed that among women in menopause, it inhibits bone demineralization, thanks to which it protects from the development of osteoporosis. Hyaluronic acid - is a multi-molecular polysaccharide, which is composed of alternately occurring: D-glucuronic acid and N-acetyl-D-glucosamine. The main amount of this compound appears in joints, where it constitutes a lubricant and ensures proper amortization for bone structures. Hyaluronic acid supports the organism in the fight with inflammations, which is a factor that inhibits the development of degradation. It also positively influences the state of skin. Providing it with proper hydration ensures flexibility, elasticity and inhibits the development of wrinkles. The supplement Flex Guard by Trec is a preparation, in the composition of which there are ingredients, which nourish connective tissue of the organism and inhibit inflammation. Thanks to such an effect, the product ensures proper functioning of joints and improves the state of skin. The supplement is recommended to elderly people and those who practice professional sport. It supports collagen regeneration and the fight with inflammations. Dissolve 15 g (2,5 scoop) in 200 ml water and take it 30 minutes before meal. The supplement is relatively safe, therefore in order to maximize the effects, a daily dose may be increased. In case of any discomfort in the digestive system, divide a single dose into several portions during the day, as some ingredients of the preparation may irritate intestinal mucosa. In order to achieve maximal effect of the preparation, it needs to be taken for the period of at least 4 months. Additional supplementation with vitamin B6 and niacin will allow to facilitate the work of enzymes, necessary to synthesize collagen. Maltodextrin, Acidity regulators (Citric acid, Malic acid), MEG-3® POWDER – microcapsulated fish oil [60% refined fish oil, Gelatin, Anti-caking agents (Sodium phosphate, Calcium silicate), Maltodextrins, Acidity regulators (Sodium ascorbate, Citric acid), Rapeseed oil, Flavors, Antioxidant (Tocopherols), Sunflower oil], Coloring for mango-orange flavor (Beta-carotene), coloring for forest fruits taste (E122), Sweetener (Sucralose).